The global focus on wildlife as a major contributor to emerging pathogens and infectious diseases (EIDs) in humans and domestic animals is not based on field, experimental or dedicated research, but mostly on limited surveys of literature, opinion and the assumption that biodiversity harbours pathogens. The perceived and direct impacts of wildlife, from being a reservoir of certain human and livestock pathogens and as a risk to health, are frequently overstated when compared to the Global burden of disease statistics available from WHO, OIE and FAO. However organisms that evolve in wildlife species can and do spill-over into human landscapes and humans and domestic animal population and, where these organisms adapt to surviving and spreading amongst livestock and humans, these emerging infections can have significant consequences. Drivers for the spill-over of pathogens or evolution of organisms from wildlife reservoirs to become pathogens of humans and domestic animals are varied but almost without exception poorly researched. The changing demographics, spatial distribution and movements, associated landscape modifications (especially agricultural) and behavioural changes involving human and domestic animal populations are probably the core drivers of the apparent increasing trend in emergence of new pathogens and infectious diseases over recent decades. The global focus on wildlife as a major contributor to emerging pathogens and infectious diseases (EIDs) in humans and domestic animals is not based on field, experimental or dedicated research, but mostly on surveys of literature that report new diseases corrected for reporting bias (e.g. Jones et al. 2008; Jones et al. 2013). In addition to hotspot mapping, such publications link diseases to possible pathogen origins from various non-domestic animal species. The assessment of these reported trends in EIDs and their impacts is significantly biased by research regarding human immunodeficiency virus (HIV) and AIDS, severe acute respiratory syndrome (SARS) and highly pathogenic avian influenza (HPAI), all of which have an indirect wildlife link. Except for AIDS, the aforementioned diseases have taken a relatively small toll on human life but have incurred huge costs, mostly related to fear induced by perceived pandemic threats and high case fatality rates and resulting from the syndrome's importance being amplified by global media. Political pressure has resulted in strong government responses and international investment in pathogen research and addressing the spread of these agents. However, it is surprising that little has been done so far to deal with the main drivers and amplifiers of the diseases, for example, through a shift in animal production systems or closure of key epidemiological nodes such as live or wet markets (Fournié et al. 2013). The potential for similar events remains or is even more likely than before, given the ever-expanding markets and associated domestic animal production systems, which are conducive to the evolution and amplification of new pathogens. This is further enhanced by the increasing movement and contact between humans, domestic animals and wildlife (Wallace & Kock 2012). Reported causes for and drivers of the apparent trends in disease emergence lack, in most cases, strong evidence-based research (Jones et al. 2013). However, there is circumstantial evidence to suggest that novel epidemics and disease syndromes are the result of changing agroecology and human behaviour and movements, intensifying interfaces with certain wildlife species and climate change (Roche & Guégan 2011). The inclusion of wildlife in the epidemiology and evolution of EIDs is justified (Keesing et al. 2010), but the role of wildlife is often misrepresented. The idea that biodiversity is the origin of many infectious agents is stating the obvious: where else would new infectious agents come from? It is not that the 'pathways' for emergence are in any way unnatural; rather, it is the opportunities for emergence that are changing and probably on the increase. The most dramatic example of this is the emergence of AIDS from the spillover of simian immunodeficiency virus from sooty mangabey and chimpanzees into humans and the subsequent genetic changes (through mutation, recombination or reassortment) enabling the evolution of human pathogens HIV-1 and HIV-2 (Gao et al. 1999). Bush meat, the fragmentation of forest and the development of road systems facilitated the virus's spread to urban centres and eventually to the global human population, causing the most significant epidemic disease in modern times. Wildlife species are a reservoir of some emerging pathogens, but zoonotic transmission is uncommon and often involves a domestic animal bridge (shown in brackets), for example Crimean-Congo haemorrhagic fever (livestock [Sang 2011]), Japanese encephalitis (pigs [Impoinvil et al. 2011]), nipah virus infection (pigs), hendra virus infection (horses [Field 2010]), plague, trypanosomosis (livestock [Funk et al. 2013]). Some of these examples of emerging zoonoses are a direct result of human interference, for example, the establishment of the pig industry and fruit farms in areas with high-density bat populations in the case of nipah virus (Pulliam et al. 2012). An additional driver of zoonotic emergence from wildlife is, the creation of wildlife habitats in high-density human settlements or recreational areas for example lyme disease (Levi et al. 2012) in the United States of America and the slaughter and consumption of primates and other bush meat in African causes the spillover of ebola virus to humans (Leroy, Gonzalez & Baize 2011). It is suggested that such bridges have, over time, resulted in the establishment of a range of human diseases, for example diphtheria, measles, campylobacteriosis small pox, pertussis and mumps (Wolfe, Dunavan & Diamond 2007). The advent of modern livestock systems is also associated with diseases such as leptospirosis, cysticercosis and echinococcosis and an array of zoonotic infections by pathogens such as the Japanese encephalitis virus, highly pathogenic avian influenza viruses, norovirus, hepatitis E virus, Campylobacter spp., Escherichia coli O157:H7 (toxin code) and the epidemic strain of Salmonella enterica serotype Typhimurium Definitive Type 104 (Altekruse, Cohen & Swerdlow 1997; Jones et al. 2013). Figure 1 provides an estimate of global wildlife-related mortalities in humans as a proportion of total incidences in an average year. A log scale was used as the wildlife contribution would otherwise not appear in most cases, which is an indication of how rare they are. Many wildlife species, from a wide range of taxa, act as temporary or intermediate disease hosts. 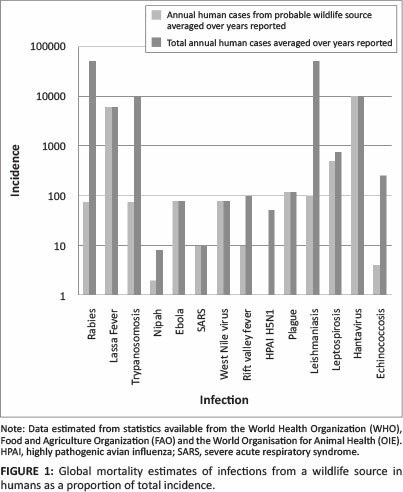 They can transmit and amplify infections over space and time but are not longterm reservoirs (Table 1). Occasionally, wildlife species are victims of or spillover hosts from domestic animals and even humans (Table 2). It is interesting that some infections are well tolerated by wild reservoir hosts, as illustrated by the association between wild birds and avian influenza viruses (Alexander 2000) and bats and lyssa viruses (Calisher et al. 2006), and the role of communities with respect to infective agents and hosts, transmission and their pathogenicity has recently become a prominent research topic (Johnson & Thieltges 2010; Randolph & Dobson 2012). However, when the contact between wild species and domestic animals or humans is intensified, spillover occurs with direct pathogenic impact or opportunity for evolution of these viruses in new hosts, as evidenced by the emergence of HPAI and SARS (Tang et al. 2009). Figure 2 provides a simplified model of this process. 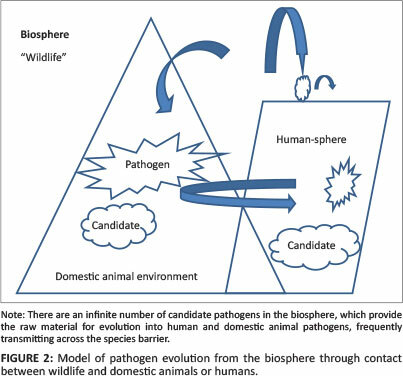 In conclusion, evidence suggests that we should not see wildlife as a direct source of pathogen threats, but rather as an indirect source of candidate pathogens. A smarter solution than trying to identify cryptic potential infection from wildlife would be to address human behaviour and actions, which are driving most of the emerging disease syndromes. If science provides the evidence and critical control points, and health sectors and society engage within the developing human landscape, pathogen emergence need not be catastrophic in its impact, and humans and domestic animals can continue to co-exist with wildlife in a rich, resilient natural world.